Though many have been entered and some have been trimmed, we have only one space left in the Jalopnik Fantasy Garage. One more bay into which we may slide any dream machine we can think of. To this point it has been a journey of discovery, history, humor, debate, outrage and delight, but still there remains only one spot. This final place has been reserved in our plans for a long time though. Despite the stereotypes held in the public eye about this car, we could choose no other to cap off this endeavor and we therefore humbly submit for your approval — the 1970 Chevrolet El Camino 454 Super Sport. What is it about us and El Caminos? Since the early days when Davey G. gave us his musings on the car which held such a strong place in his heart, through the last few months, which have seen the scion of the El Camino debut, and countless chopped up and rebuilt cars in between, we are El aficionados. And despite the awesome spectacle that is the Porsche 928-amino and acres of El Caminos at the Woodward Dream Cruise, there is only one El Camino we can hold up as the king of the ring, a true fantasy with no peers and of course the most powerful production truck/car ever built for US shores. So You Want a Porsche 928amino? The 1970 Chevrolet El Camino 454 SS is the pinnacle of Chevrolet's car based truck dynasty — but it took a long time to get there. The El Camino was initially introduced as a response to the strong selling Ford Ranchero and came out for a couple of years starting in 1959. The light pickup was initially based on the wild styling of the Chevrolet Impala, which, despite the unique and desirable nature of these early cars today, was not well received at the time. When the car was reintroduced in 1964, everything had changed. Now based on the Chevelle platform, the car was much more ready for work. Instead of flashy appendages flying everywhere, it was slab sided and lighter than the original. As styling progressed on the Chevelle through the years, so too was it mirrored in the El Camino. 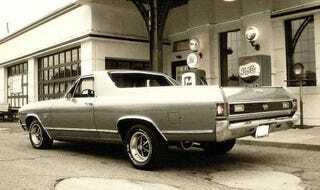 Whereas styling was always up to date with the El Camino, it was left behind on power. All through its life, it saw every engine of its automotive brethren except the highest performance mill of the time. This changed in 1970. After two years of having the 396 V8 putting out a very respectable 375 HP sitting as the top of the options list, the mighty LS6 454 V8 was added. With a stated power rating of 450 HP and 500 lb/ft of torque, this legendary motor propelled the El Camino from a stop to 60 in only 6.6 seconds, it would make a quarter mile run in 13.4 seconds - remember, on 7" wide tires with a four speed manual. Perhaps more important than the figures and the ridiculousness of this car is what it means. The 454 SS isn't a car you give to mom to drive to the grocery store. It is the simplest way to turn rubber into smoke. Hoonage personified. This is a car you get into trouble with. It's a leather-jacketed, chain-smoking, knife-wielding, hard-livin', "Screw you" to proper society. No other car makes less sense, but is so perfect at doing it. It is the antithesis of business models based on a public bored to mediocrity by way of market research and ad campaigns touting air bags and child safety seats. Once upon a time you could go to the dealer, plunk down your hard earned scratch, fire up that 454 and hit the road, light up an unfiltered cigarette and crank out Led Zeppelin's Ramble On over the pushbutton AM/FM radio. We want the El Camino in the garage not just because it's a badass ride, but because it's a sucker punch to the flabby gut of political correctness.